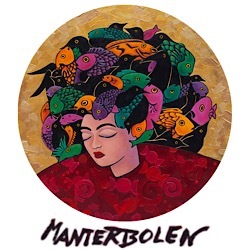 Susan Manter-Bolen (aka ManterBolen) creates surreal and symbolic landscapes, portraits, and dreamscapes featuring archetypal and anthropomorphic figures in vividly colorful and geometrically stylized environments. 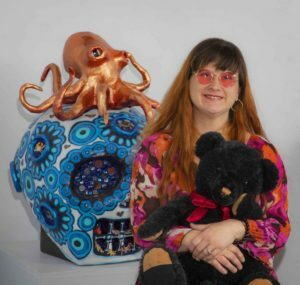 She works predominantly in acrylic, occasionally experimenting with alternative mediums such as unique wooden shapes, found objects, and recyclable materials. Susan also sculpts unique pieces in the Day of the Dead “sugarskull” tradition. Susan lives in California with her husband John Bolen and participated in her first annual Sierra Art Trails event in 2007. In November of that year, she celebrated her debut solo show at Williams Gallery as the Sierra Art Trails’ Artist of the Month. Who Support Us 😃 including YOU!